It’s the online slot fanatics dream – striking it rich with one lucky spin of the slot reels. If you think it can’t happen to you, these stories of the biggest progressive jackpot slot winners in recorded history will prove that you can score a life changing win playing slots online, all you need is the right amount of luck and the right online slot game. A progressive jackpot slot game is one where the jackpot prize increases every time a real money bet is placed on that same game within a shared network. Progressive jackpots start with a base jackpot and then every time a player makes a wager on the game, a certain percentage of the bet is pooled to make the jackpot climb higher. Online slots tend to offer much larger progressive jackpots than land based slot machines, as the online progressive jackpot network has the power to stretch much further. Many progressive jackpot online slot games start with base jackpots as high as one million dollars, and soar into the multi-millions. Just check out some of the lucky winners below to see how much you stand to win when playing progressive jackpot slot games online. As of early 2017, the holder for the Guinness Book of World Records title for Largest Jackpot Payout in an Online Slot Machine goes to Jon Heywood, a 26-year-old British former soldier who won a jaw-dropping €17,879,645 playing the most popular online progressive jackpot slot of them all, Microgaming’s Mega Moolah. Completely shocked by his win, Heywood returned to work as usual the next day and kept his win quiet for three days as the news slowly sunk in. Mega Moolah is an African safari themed online slot game that remains hugely popular despite its outdated graphics and lack of exciting bonus features. It’s win’s like Heywoods and the base jackpot of a whopping $1 million that keeps players from all over the world coming back for more. Imagine this – you deposit money to your online casino account, click to load one of your favourite online slot games (Net Entertainment’s heftiest progressive jackpot slot game, Mega Fortune), absent-mindedly hit the spin button and within seconds you find yourself €17,861,800 richer. To make this scenario even sweeter, imagine the multi-million-dollar win was from a measly €0.25 wager. This is exactly what happened to one hell of a lucky player back in 2013. 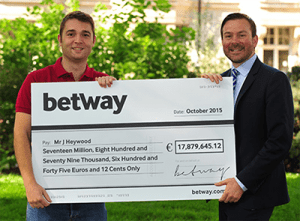 The 47-year-old Helsinki man, who remains unnamed, spun his way to instant wealth as well as the Guinness World Record holder for the largest jackpot payout in an online slot machine (before being bumped out by Heywood in 2016). NetEnt’s Mega Fortune offers players a glimpse into the high-life they could lead if, like this Scandinavian gentleman, they are lucky enough to strike it rich while playing this game. 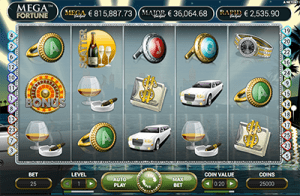 Mega Fortune is full of icons of decadence, like diamonds, champagne, sports cars and other riches. It is available for both desktop and Playtech’s progressive jackpot game, Jackpot Giant. The bet was placed using the librarians Samsung Galaxy at favourite online bingo site and came from a spin that cost her just £4. The winner, who chose to remain anonymous, said, “I picked up my mobile and started playing while I was watching TV. Minutes later, I saw a huge string of numbers coming up and realised I’d hit the jackpot. I was simply blown away and couldn’t believe I’d won. It’s still sinking in and my family and I are still in a complete state of shock.” She was back at work the following day as the reality of her win sunk in. The second biggest win on a Playtech progressive jackpot slot game occurred in February 2012 when a South African player won the $8,211,861 playing Playtech’s Beach Life slot game. The above records are just a small insight into the millions of dollars that have been won playing progressive jackpot slot games online. While these stories are of the biggest winners, they are not stand-alone accounts, as most progressive jackpots are triggered on an average of approximately every six weeks or so. The bigger a jackpot gets, the more players flock to try their luck on the game and the bigger the jackpot grows, so it’s a never-ending cycle that presents a world of possibility. Progressive jackpot slot games can be found at all our recommended online casinos, but be aware that not all games are available to players from all countries. Some progressive jackpots require real money bets in order to play, while others require the maximum bet be placed for the jackpot to have the potential to be triggered. Read the rules of the slot game you have chosen to be sure you understand what is required of you before you dive in. It is also important to remember winning the jackpot is based entirely on luck, and there is nothing you can do to influence the outcome of the game. Always gamble responsibly. To see which progressive jackpot slots are available to you, head to one of the top-rated casinos in our table above, which has been geo-targeted to recognise your location and only recommend casinos that accept players from your country.